An interview with Dan Hollander, 2-time US Bronze medalist, and long-time member of Champions on Ice. 55 minutes, 28 seconds. On his most embarrassing skating moment: Oh my God, there’s so many to choose from. 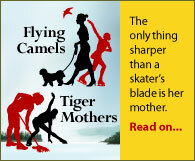 There’s one that sticks out in my head, I don’t know if it’s embarrassing or because it stinks, but it was Junior Men’s at Midwestern, in the long program, and after my program started I had to do a flying camel, and my edge slipped out from under me and I did a full-length belly smack. John Baldwin has this blooper reel of all these mistakes, and that was the headliner, and I didn’t see it until years later and I went, oh my God, that’s me. But I remember laying on the ice and like five feet away was the door, and I thought, you know, I could just crawl off the ice right now and I would be very happy with that. But I kept skating. On how he started skating: My mom was my sister’s Brownie troop leader, and they all went [to the rink], and I kept wanting to skate until the last day, which was public skating, and I got on the ice and loved it and went back for more. And I saw the ads on TV [with a hockey player] who was all cut up and scarred up and looked so mean, and I was, wow, that’ll never happen. And ISIA [Ice Skating Institute] had little bunny hops as part of their tests, and I would do little barrel jumps because I didn’t have toepicks, and that was kind of fun, but I realized that I couldn’t do all the other cool stuff on the ice if I didn’t have toepicks. And I remember this other little boy who would lie down on the ice and I would jump over his legs, but nowadays it would be like, whoa, what were you thinking, that’s so dangerous. And then one day he was like, OK, it’s your turn. So I laid down, but he was like one of those really wobbly skaters, and in my mind suddenly this big red alert went off, and I was like, what are you doing? And he made it over, but I was like, that’s the last time I’ll do this because I don’t want to give him the chance to do it to me. On being inspired by Scott Hamilton’s “chicken” show program: I just cried, and I just wanted to do that, to make people laugh. On how he started working with coach Diana Ronayne: As a kid, I totally wanted to move [when his previous coaches, David and Rita Lowery, moved] but my parents weren’t going to have any of that. They’re very family-oriented and didn’t want me leaving. And one thing that I wasn’t aware of at the time, because my parents are always very positive and try to teach you not to talk bad about a certain person or situation, which I guess I’m still trying to learn [laughs] — I was failing a lot of tests, and I have the same opinion that they do, if you fail a test it should be because you didn’t do well and not because you’re not prepared. So when [the Lowerys] left it was an easy way for them to say, OK, you’re not switching coaches, you’re staying here and we’re now going to try another coach. On having passed gold tests in singles, dance, figures, and field moves, but not in pairs: This really bums me out, Mr. Jon Robinson, I’m totally outing him [laughs], Mr. ISI Guy, he just passed his field moves a few years ago. My goal was to have all five [gold tests]. So about three years ago I took the field moves here in Sun Valley and then I wanted to take pairs. I have my gold dances too. I even competed in dance for about a year with Julie Benz, she’s an actress now, in Rambo and all that, and I could totally tell you about that debacle [laughs]. But in any case, Frank Sweiding and Anita Hartshorn were out here and they said they would teach me. So I had a girl who was my size and almost my weight, and we cranked through the first few [tests] with the smaller lifts, up to novice. And then when I found out that [Jon] beat me to it, I was like, I don’t want to do it anymore. And it was the end of the summer and I was trying to push through learning things like split double twist, which is very hard in my opinion [laughs]. And then the rules were going to be changed to reflect more realistically what would be at each level, which would make me have to learn a whole bunch of lifts that I definitely would not have been able to do. On placing third at the 1996 US Nationals: Mentally it was always my issue to get focused and to get the job done. And you look at someone like Todd Eldredge and it’s like, he did clean programs all the time. When I look back at my [amateur] career, I think I completed four. It was the mental training I was getting, which was not conducive to being consistent. In 1994, my dad called a meeting between Diana, myself, my psychologist and him. He said you have a choice right now. Either you’re going to skate full-time and have a real go at it, or you’re going to go to college full-time. But you’re failing both. I think he was hoping I’d pick college but I picked skating of course [laughs]. And he laid down the law. He said, here’s the thing. Everyone has their own jobs to do. Dan, your job is to skate. You don’t go to school, you don’t work, you don’t do anything but skate. And he looked at the psychologist and said, you mess with his mind and make sure he’s focused. And he looked at Diana and said, don’t you even talk about his mind or anything, you just do the drills. And he said, and I’m paying for it. So in 1995 I did a little bit better. And Scott Hamilton, he once said something to Mitch Moyer, to be a champion you either have to be a butthead, but using the other word [laughs], or you just don’t care. And it made sense, it hit home. I’m not a jerk because I don’t have that competitive instinct. So the other thing was, I don’t care. So [in 1996] I was at the point where I remember walking backstage before I went out [for the long program], and watching on the monitor, and Michael Weiss fell on a jump, and the first words out of my mouth as I’m pacing back and forth and looking at it were, well, I can do that jump. And then he landed a nice jump, and I was like, hmph, I can land mine better than that. It was like I was programmed all year to do the job I wanted to do. It wasn’t me, but I was programmed that way. And I went out, started the program, no nervousness, the whole thing just happened. And at the end the whole place was standing, and I was shaking my fists, taking my bows. That was all choreographed. I did that in my hotel room the whole day before, exactly how it would happen. And I looked up and everyone was standing up, and I went to — I’m blanking on the name now, Skate Vienna, a dance team — and he pointed at me and I pointed right back, and I’m like, yeah, I told you I was going to do it this year, and it was just — it was really cool. I put it out there, I saw my friends and family giving me a standing ovation, and I’m like, aw, thank God I’m here, I’ve finally done it. On his experience at the 1996 world championships: I wasn’t as focused because it was all new and all exciting. It went well, I was happy to make the top 10. On his experience at the 1997 world championships: Oh, good God, 1997 was awful. What happened is, I had this stress fracture injury on my ankle. And I’ll call a spade a spade, and if people are upset, I don’t care, I guess, because I gotta be true. Because I had the injury, my mental focus was off. And unfortunately Diana was able to get into my mind, which is what her job wasn’t, that was supposed to be the psychologist. And I was mentally exhausted battling, in my opinion, very mentally abusive traits. So therefore by the time I got there, I was just spent. I was done. My fighting was done, my ankle hurt, I wasn’t eating well, and I had no confidence at all. And I went out there [for the qualification skate] and – you could be a pre-preliminary man and still make the initial round at Worlds at the time, in my opinion. And I think I rotated two axels and fell or singled everything else. I mean, it was just awful. So I got off the ice, and I was standing there, and the first words out of her mouth were, oh my God, how could you do that to me? What do you think the judges are going to think of me now? And I just remember thinking, well, no one thinks about the coach, I’m the one that just went out there and skated like that, I’m the person who’ll get the hate mail too. And at that moment I was just like, I’m done, I can’t do this anymore. Either I find someone else or I quit skating. So I moved on. It was OK, but what most skaters do at the end of their careers, at least in my opinion, we’re so used to it, that’s our cycle. We compete the next year, we come up with new programs, that’s what we do. So did I hang around for another two years that I shouldn’t? Yes. But I wasn’t ready emotionally to let go and move on to the next level. On studying martial arts: I’ll just go ahead and tell you, the reason why I took martial arts, I was always interested in it, and at the age of 16 I was really unhappy with the skating and I just started taking it to Diana. And I got off the ice because I had had enough, I was in tears, and I walked down this long hallway, and as soon as you clear the hallway the rest of the rink can’t see you. So I opened the door trying to go into the locker room, and I didn’t realize she was right behind me. And she grabbed me from behind and yanked me back through and started ripping me a new one. And I remember feeling so — I had never been physically grabbed or yelled at, and I couldn’t defend myself. And I felt really helpless. So that’s when I started martial arts and I started weightlifting, which was good for me because I was a little scrawny dude. So later on if there would be wrestling or something just going on, I could lift her in the air or whatever. Which wasn’t a big deal, but at the time when you’re 16 to have that power and that confidence to know that mentally, if I ever had to defend myself I could…that’s kind of where that started. On being competitive in professional skating: I wasn’t very competitive until I got into the pro circuit, and then it’s all about comedy. So if there’s some other person in the show attempting to do comedy, I’m extremely competitive. Which I never thought. But now I’m like, bring it on. Come on, Petrenko. You want to have a doll and skate with it? I’m ready. I can make people laugh more than you. It’s wild. It’s a new part of me that I never realized, but I guess it’s what I own and what I feel. On joining Champions on Ice: It was 1996 [at US Nationals] when [Tom Collins] saw me. Slavka Kohout Button, who taught Diana and that’s why she latched onto me a little bit too, she whisked me up into a little booth with Tom and all the officials and whatnot. And Slavka looked at Tommy, and she’s probably one of the only people who could look at Tommy like that, and said, you’re putting him on your tour because he’s really good. And he just looked at her and said, oh, okay then, I guess so [laughs]. On the experience of professional tours: A day in the life of Champions, it was so amazingly hard [laughs]. You would wake up in the morning and you would put your luggage outside at call time. And then you would walk out and it would magically be gone! And then you’d get on the bus and you would go to the venue and then you would have, like, a nice little dinner, whatever you want, and then you would work out, and there’s a 20-minute time when you could skate. And meanwhile you’ve got the pool table, you’ve got ping-ping, Xbox, whatever, it’s just so hard to have all that stuff to play with, right? And there’s one side with the computers and we’d do our stuff on the Internet, and then the show would start, and you would do your job, you’d do the opening and your one number, and then the finale, so it’s not you’re working through the entire show. And then you’d come back and have your shower, and there’s food for you then too. And then you’d get on the bus, if it’s a night for travel, and you’d go maybe three, four hours, it was never too long, and then you’d get to the next hotel and magically your luggage would be there for you! In your room! It was a very difficult lifestyle living in the Four Seasons [laughs]. By far it was the coolest tour ever. It was the ultimate. On getting along with other skaters on the COI tour: When I first got on in 1996, it was the old school, Todd Eldredge, Kurt Browning, all those older skaters, so to speak, that were a big clique. And then slowly some of them started leaving and some of the newer ones would come on. And I guess, you know, everyone has their own cliques. It would always be me, Elvis [Stojko] and Mike Weiss hanging out and doing the guy things with the remote control cars, and going to Sharper Image, and renting Harleys and doing cool stuff like that. And then you’ve got the other crew of the different girls and some of the guys that liked to go shopping together in Prada and Gucci and all those things. And then you had the Russians who would go out and hang out and play chess and do their thing. So everyone found their niche and chilled with themselves. On career options for professional show skaters now: The thing I would recommend to everyone is there’s something called www.proskaters.org. It’s an organization that helps skaters figure out, here’s how you make a demo DVD, here’s who you send it out to, here’s a list of all the producers, and it’s where the producers post all their [jobs]. You’re right, it’s not going to be the big bucks that it was before, because the popularity has gone down and the money isn’t there. And I don’t think the money was distributed evenly in the first place, like to the [USFS] Memorial Fund. I think the management of that could be better. I know it could be better. Michael Weiss, I love his foundation, it’s close to 100% of the money that was donated that was given directly to the skater. I’m not saying the Memorial Fund doesn’t do a good job, because they do, I’m just saying that it could be a higher percentage of money given out as opposed to [being] put toward other things, administration or whatever. But you’re right, there’s only a very very small number each year going on Stars on Ice, and agents don’t really get you shows. They’re just there to say, oh, you want this person, well, I’ll negotiate a price and take a percentage of it. So the skaters of today have to realize that the money just isn’t out there, and you’ll have to do a Disney [on Ice] or a cruise ship or whatnot, which can be decent. You can go see the world and have a bit of money to go to college. That’s kind of what shows are about nowadays. On the information on his website about how to choose a coach: As I was telling parents this stuff, I was kind of blown away by how little they knew. And to me it’s such an expensive sport, there’s something that should be demanded, you know? And so I’m fine with educating about that. And have I heard some grumblings from some other coaches that were unhappy and thought that I should have that taken off? Absolutely, but why are the [parents] unhappy? They pay and nothing gets done. 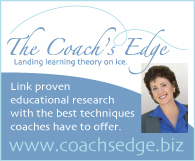 How do you know if that coach’s technique is right for landing jumps, or for that skater? You don’t. If you’re not in the sport or you haven’t done it, how are you expected to know? You need to do your homework and research it, and ask their opinion and take it with a grain of salt. It’s a tough thing to do. I could say, in my opinion, this is the best thing to do. But there’s other top coaches who might vary from what I’m saying. I just try to be the most logical I can, and explain to the parents, like, if I can’t explain to you why your child’s axel is off because their leg is slipping this way, then I shouldn’t be allowed to coach your kid. On seminars: My strengths by far in teaching are technique and getting across the physics of jumps and spins, and I do it in a fun, entertaining method. So like, your left arm is always supposed to be in front of you so you don’t check way far to the left if you’re an over-rotater. So I grab the kid and I’m like, you take a spear and you shove it in your belly button and if you rip that spear out blood goes everywhere, and you don’t want to do that because that’s very disgusting and sick. And they start laughing and giggling. And I say, and your shoulders are way high up when you skate, and your shoulders have little meat hooks and you shove them down in your lower back and yank them down. And they’re like, ewww!, but they remember it [laughs]. So I yell out, like, fear, or trolls, or stuff like that, and they immediately get what I’m saying. And it’s been really cool going to do a seminar, and I’ve stayed a couple of days later to do some private teaching, and seeing some of the coaches there using my terminology with the kids, because it worked. And I’m like, hey, right on.